Well it wasnt really like that.. he didnt just go lighter and lighter in public, there were times his makeup made him look lighter vs. Darker.. look at the bad cover and look at how he looked after.. darker! Or behind the scenes on the black or white video compared to the actual video. Pretty different..
Michael has his mixed race skin tone till the end of 1991. In the Black or White video, his skin tone was that of a mixed race person. But by early 1992, his skin tone was lighter. The video for Remember The Time that was shot and released in early 1992 perfectly showcases the change in Michael’s skin tone. And like the poster above said, it’s all about the makeup. During the Bad era, Michael’s makeup was darker, hence why his skin tone was mixed race. But from 1992 onwards, he started using lighter makeup, and that showcased his actual skin tone at that time. I’ve often wondered about this. He looks the exact same as the Bad era for most of 1991 and then by the time Black or White rolls around he looked very different. I wonder if it was a skin tone thing. I know from Black or White until at least 2005 he looked the same (there’s plenty of great comparison pics). Just watch the footage in 1990-1991 in Neverland with macaulay culkin. he's talking about skin color, plastic surgery have an effect on the skin ? I know from Black or White until at least 2005 he looked the same (there’s plenty of great comparison pics). Idk what people are talking about within the dangerous era alone his skin tone changed.. by 1993 we never saw a darker shade while 1991 we would see moments that hed look 'tanner'.. no 93 and on shades of darker!
. Beginning of dangerous tour to end.. In my opinion it was only skin tone that created a perception of great change. It makes me sad to see people still talking about this in 2018, to be honest. Yeah, there's that great pic of Thriller era Mike superimposed over the They Don't Care About Us single cover and they look the same. I've always agreed with MJ about his facial work, the pictures prove it. Sure he had botox, but corrective surgery I don't think he lied about. There is no way to find that out. 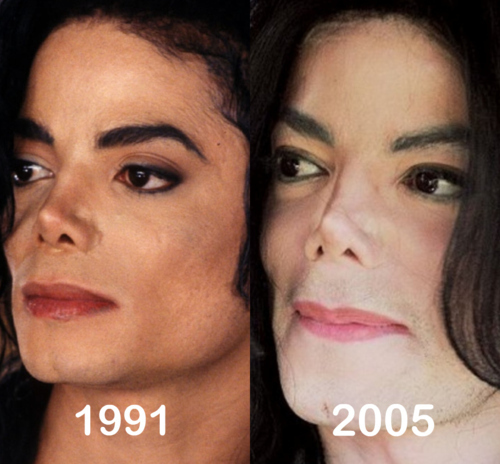 Make-ups for creating slightly different skin tones, face creams meant for the same reason, different settings of cameras, different lightings, colour image editing of his photos, are some of the factors that do not let us have a clear perception regarding when exactly his skin colour transition actually took place (from BAD to Dangerous era). Even his skin colour on the ‘BAD’ album cover is misleading (due to post-shooting, image tone editing), because MJ’s skin colour at the time actually was darker than the one on that cover. but wouldnt plastic surgey have some effect on the skin?